the us in russ: A Table For "Two"
Tonight we made an emergency diaper run to Target (what a great family night activity). On the way Lila requested that we get hot dogs in the Target "restaurant". Since there is a Friendly's in the parking lot of Target and I hate hot dogs, we opted to go there and have dinner and ice cream. Shortly after we sat down, this couple was seated next to us. They have 2 year old twins and a 6 month old baby. Sorry about the blurry cell phone shots, but I had to document this and it was all that I had available. We smiled and chatted a little about how funny it was to run into another family with twins. 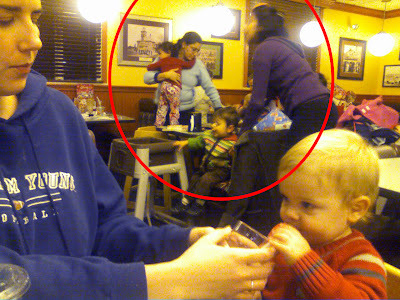 Then a few minutes later this family with a toddler and twin babies was seated. While walking in they noticed the previously family with twins and started to talk to them, then they pointed over at us. We all laughed at the odd coincidence. Then a little bit later this family walked in with another set of twins! Four families with young twins and another child all seated together at the same time. What are the chances of that? After seeing the shocked look on peoples faces all the time when they find out we have 3 kids under 3, it is nice to know we aren't alone in our madness. Maybe our crazy life just isn't so crazy after all. That is so funny. You guys attract so much attention when you go out because you are sooo cute. Your kids are adorable! I loved the BYU sweatshirt. BYU does play Utah on Saturday so good job on wearing Blue! 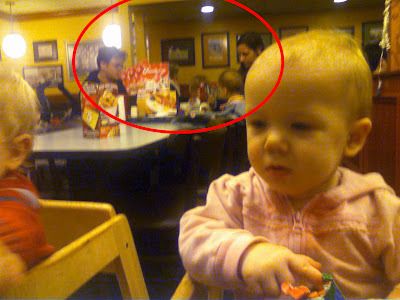 I told Casey that you went to eat and saw all of these twins.... not to be rude, but he wasn't really that interested. He asked where you ate at and I said Friendly's and he about FLIPPED OUT. He said that Friendly's has the "BEST ICE CREAM EVER!!!". That is really crazy, but maybe Boston has a higher than average twin rate!! you guys certainly have a huge twin sale! And, I have to comment on the BYU sweatshirt, too since I rarely wear mine and here I sit in my BYU blue sweatshirt!! Is that just as crazy?? You amaze me with three kids under three...AWESOME! Nat, good thing Casey was at least excited by something! Remember when you guys were here and we went to Friendy's. I was on a no-milk diet and you guys got ice cream without me... so sad!! I realize now how rude it was for us to get ice cream when you were on a strict non-dairy diet. Especially since you weren't eating dairy so your children's tummies would feel better. But then again, I was 12 weeks pregnant, so I think everything evens out. Hey it is cool to hear how things are going. We've been looking at you blog for a while now but we aren't the best commentors. (is that a word?) Anyways, we were wondering what is in the water in Boston? Bottle some of that water up and send it our way...we would love to have twins! Mitch says they're the coolest. Hope you have a happy Thanksgiving! Hope no one takes offense to my comment, but this appears to be the miracle of fertility treatment in Massachusetts. When Mindy was delivering Kay Lynn, the nurse mentioned that we were the only single baby delivery on the floor. Though I don't know if there is a connection between fertility treatment and a love of Friendlys. Maybe its the Fribbles. That is so crazy! I see so many twins all the time and we have so many friends with twins...we are feeling out of the loop:) I really don't think I could ever do twins, but you guys seem to be doing so well and having so much fun with those sweet babies. This is Kyle. I've been commenting on all our friends blogs, so I can't leave you out. You have my respect for handling twins. I'll be perfectly happy to bring them in one by one. How much longer are you guys in Boston? If you're there for a while, you could have couple more sets of twins. Wouldn't that be fun? You were not last on my list. I do vicarious through Emily and she's been active on your blog for a while so you were actually first on my list. 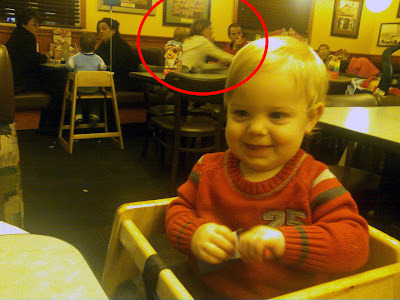 That is pretty crazy, but it is also very very sneaky how you pretended to take pics of your kids to get the others in the background....nice! WOOOOOOOW!!! and for the record Emergency is "none" in our house.